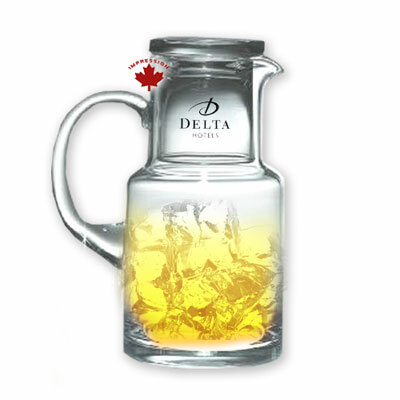 Crystal clear water set etched (engraved) with your company logo and message. Water Carafe sets and Water Pitcher sets are appreciated and practical gifts. Etched $62.00 $61.00 $60.00 $58.00 each. Setup cost for each design or position is : $110.00. We need 15 working days to process your request. If you has approved your final artwork and paper work has been completed today(Apr 22, 2019), the estimated shipping date will be: May 10, 2019. We prefer to accept .AI or .EPS graphic file in Black & White with no colours or shades of Grey. Can I fax you a copy of my logo? No. Because a fax does not print exact straight lines, and we do not recognize it as camera-ready artwork, the faxed logo can be used as a guide only to verify the electronic artwork and can not be used for production. To ensure safe delivery by parcel carriers, additional packaging is required. $10.00 per shipping carton will be added to the invoice.